Paul Naschy is Waldamar Daninsky. In my previous posts I haven’t even touched the 3-D imagery of the La marca del Hombre lobo, and that’s really what this blog is all about. So let’s get to it. I’ve yet to run across anyone who can claim to have seen the film in 3-D, so we’ll have to use a bit of imagination to determine what the film looked like in the third dimension.Our first bit of information comes from the film’s American distributor, Sam Sherman. During his audio commentary on the Shriek Show DVD of Frankenstein’s Bloody Terror Sherman recalled seeing La marca del Hombre Lobo in 3-d from its original 70mm print. He describes it as a showcase for depth making little use of screen piercing effects. Something today’s filmmakers seem to be striving for as if it were a new concept. As one of the only North Americans to have seen this film in its original stereoscopic format, we’re forced to take his word for it. Careful viewing of the film flat seems to support Mr. Sherman’s remembrances. Despite Sherman’s observation that different takes may have been used in the 3-D version of the film, or even an extra camera shooting flat may have been used, I believe the 2-D version of the film to be a pretty good indication of the 3-D version’s camera set-ups and composition. I come to that assessment by comparing the still I posted previously and the versions of the film I have seen. La marca del Hombre lobo by all indications is a film stacked for the stereoscopic image. 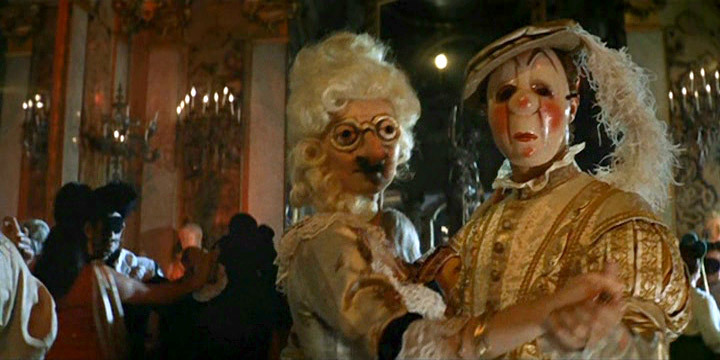 In its opening masquerade scene we are treated to balloons and confetti that float into the filmgoers laps. While Janice and Rudolph, in full masquerade, waltz past the camera the couple turn their heads to peer at the audience, as if to poke the extremely long noses of their masks out into the theatre space. It’s no accident that Janice’s mask is adorned with a beak for a nose. Janice and Rudolph pause to address the 3-D viewing audience. La marca del Hombre lobo makes use of its depth to pull you into its world, rather than thrust it out at you. Janice's father the Count joins the villagers in the hunt for Imar Wolfstein. These images can be viewed with anagylphic glasses, the red lens over the right eye. In a scene I'll refer to as The Hunt for Imar Wolfstein, Daninsky and Rudolph are paired up hunting the original wolfman that would during this scene turn Daninsky into the same such creature. It is set in a forest with uniformly spaced trees, and ample opportunity to provide depth with the occasional tree truck in the brushing through the foreground past the spectator. The setting is similar to the fairytale forest featured in Dario Argento’s Suspiria (1977). It’s here that I’ll pause to complement director Enrique López Eguiluz and cinematographer Emilio Foriscot. Director Enrique López Eguiluz had previously worked with Naschy on Agonizando en el crimen (1968) and Dyanik Zurakowska (Janice) on En Andalucía nació el amor (1966). He would follow up La marca del Hombre lobo with a Santo's film Santo contra los asesinos de la mafia (1970), one that I have still yet to see. Cinematographer Emilio Foriscot had shot another “mark” film that same year, Il marchio di Kriminal (1968) a follow-up to Umberto Lenzi’s master thief fummetti adaptation Kriminal (1966). Eguiluz manages to mature the monster kid-styled story by playing up the romantic tensions between the characters. Not just the love triangle between Waldemar, Janice and Rudolph, but also the additional seductions by the vampires. love triangle and Rudolph's increasing isolation from our heros. Foriscot's lighting makes liberal use of coloured gels to create mood and atmosphere in the film. It's visual aesthetic has a lot in common with films like Suspiria and Mario Bava's early colour work found in Black Sabbath (1963) and Kill Baby Kill (1966). The real stars of the film, as far as its stereoscopic qualities are concerned, are the locations. Janice and Waldamar in the monastary sanctuary. The cavernous locations set in the interior castle and monastery are perfectly suited to a 3 dimensional film. Shot on location at San Martin de Valdeiglesias, provide a lybrithian tunnels and gothic edifices that not only work well in 3-D, but are utilized by Eguiluz and Foriscot to create equally rich atmosphere viewed flat—the way this film has been seen for decades. Another example of a frame stacked for a 3-dimensional effect. 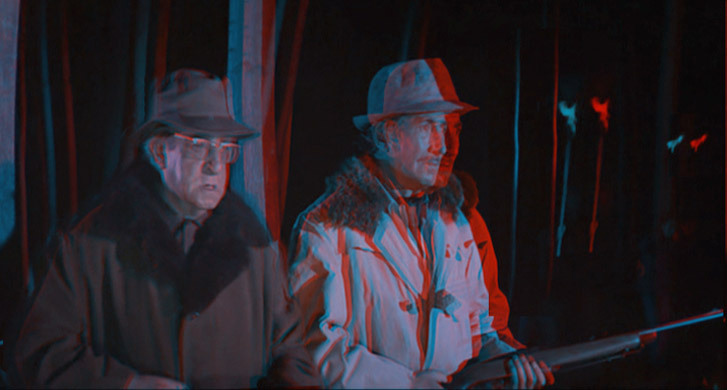 Unfortunately, I've never seen a print that looked like it could have come from an alternate eye view, and the film has never surfaced in 3-D in either Midnight Screenings, anaglyph TV prints or as private collectors grey market items. It has also been rumoured that Sam Sherman's over-and-under prints have turned red with time and are unwatchable. The source material used for the Shriek Show DVD of Frankenstein's Bloody Terror definately shows the signs of its age. I can't confirm this however. But Sherman does still have his 70mm print of La marca del Hombre Lobo and the Spanish company Vellavision recently released an absolutely gorgeous print of the film. Perhaps the original Hi Fi Stereo 70 m/m negative is still out there. We can only hope that the 3-D Blu-Ray push for home theatre content will unleash forgotten classics like La marca del Hombre Lobo in the next decade. A dramatic death of the vampiress Wandessa at the hands of the Wolfman. Just a note about the imagery in this post. 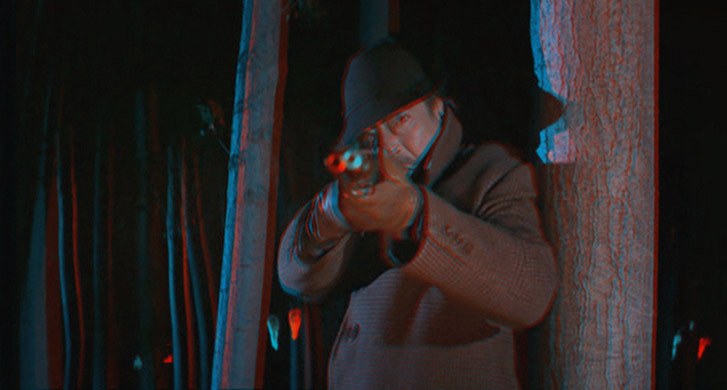 The anaglyphs are conversions produced to give you a taste of what this film could have been like. 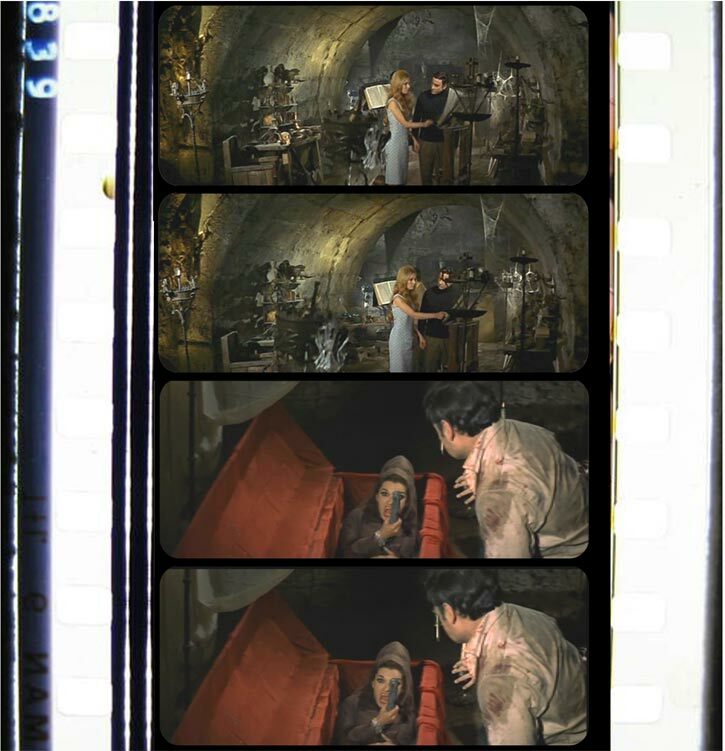 The images in the filmstrips are likewise doctored film frames used to represent what the originally 3-D film prints may have looked like.